Doran DS5100 Digital Physician Scale w/ BMI Calculator. 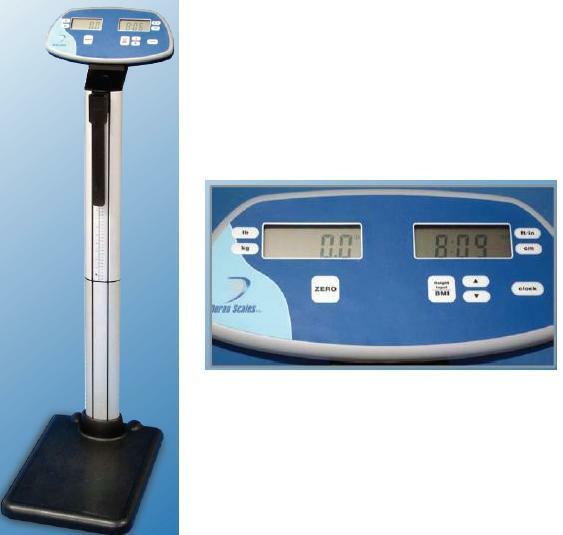 Step up to a faster and easier way to weigh patients with the Model DS5100 Digital Beam Scale. The ideal scale for a busy physician's office, the DS5100 displays the patient's weight in just three seconds after they step on the large 15" x 13" low profile platform. Sliding counterweights on a beam and waiting for it to settle is a thing of the past. The sturdy aluminum column houses the EZ-Slide height measurement rod. Enter the height using the scroll buttons, press the BMI button and the patient's Body Mass Index is instantly displayed in the right LCD. The Model DS5100 features large, easy to read controls. Data is displayed in dual 1" high LCD's. Shane is a Registered Nurse and if you have any questions about this clinical scale, please call us Toll Free at (800)355-2956 or (701)223-9936.